Social networks were the first phase of digital P2P. They enabled anyone to create media and then share it. The Collaborative Economy is the second phase. It enables anyone to create goods and share what they already own. So, how similar or different are the funding amounts for these two movements? This post provides some insight. There are many ways to compare industries. I’ve conducted analysis on: adoption rates, attitudes, growth rates, and, in tech-heavy industry, funding rates. While investors have often known to be wrong, funding indicates bullish attitudes based on financial analysis and gut reaction to new markets. It’s a metric we must analyze. If you want to see the full perspective of funding, advance to the Google Sheet of Collaborative Economy funding. Please note that there are multiple tabs. To produce this comparison, we gathered publicly available information about consumer-facing, popular social networks, like Facebook, Twitter, and LinkedIn (and 17 others) to find out how much money a mature market, complete with winners, losers, and IPOs, has been funded. Next, we gathered public data about funding in the Collaborative Economy (Uber, Airbnb, Indiegogo, and hundreds others) to see what we could find. 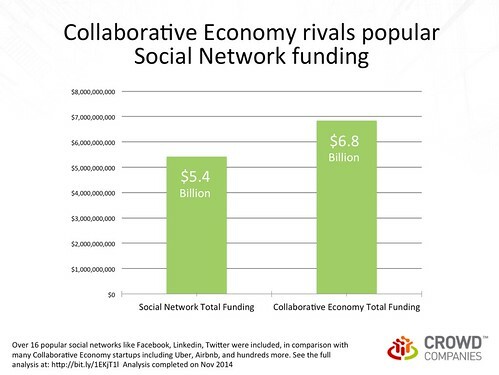 If you compared, percentage wise, the Collaborative Economy has been funded 26% more than popular social networks. This isn’t an apples-to-oranges comparison: There are few fewer social networks (we looked at 20) than Collaborative Economy startups (we tabled 497). There is no public data for many social networks that died by the wayside lack. Often, funding in early stages is not reported, so it’s impossible to ever truly know what the total funding amount for many companies. Early seed and angel rounds aren’t typically reported. While social networks aren’t likely to be funded significantly greater, I expect that many Collaborative Economy startups are going to receive significantly more funding. I didn’t tally up enterprise social business software funding (community platforms, social media management systems) as there isn’t comparable software for the Collaborative Economy …yet. This doesn’t mean that all Collaborative Economy startups will succeed. Markets often only have room for three players – not like the dozens of transportation players currently available. It could also mean that Collaborative Economy companies need to be more resource-intensive to lift off the ground. It certainly means that investors, many who funded social networks, are also bullish on this next phase of P2P sharing.